Why Our Auto Transport Services? Like any customer looking for a service provider, you want to find the best quality at a good price. You want the job done on time and without any hassle. You don’t want to overpay and you want to know what exactly you are paying for. It works the same way when you are choosing an auto shipping company. In order to get reliable auto transport services, you need to do some research before you book with a car shipping provider. There are many of them in the business, and you will have plenty of options from which to choose. 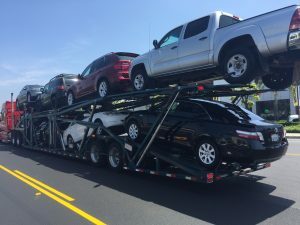 Omaha Car Transport: Why Our Auto Transport Services? Omaha Car Transport does everything possible to make sure you are happy with your Omaha Car Shipping. We’ll pick up your car from the location of your choice and ship it door to door. And we’ll make sure the time window of delivery fits into your schedule. Our team wants everything to go smoothly for you! Our agents know how to get the best deals for our clients. With us, you will get some of the best rates for Omaha Car Shipping. We also offer special discounts because we know you don’t want to overpay. We will do our best to get you a good price! Omaha Car Transport provides safe and reliable car shipping. Our drivers provide insurance for the vehicles they haul and follow all regulations. With us, you can be sure the job is done right. You will get your car back in great condition and on time! © 2018 - Omaha Car Transport. All Rights Reserved.